Shower glass went in on Tuesday and the mirrors were installed this morning so…. finally, the master bathroom remodel is complete. 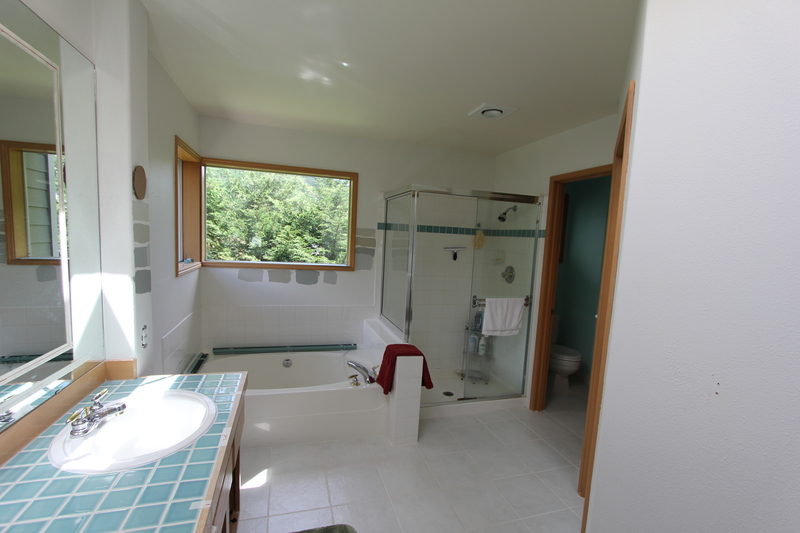 Gone are the old bath tub and little shower, replaced with a 4×6 shower space with travertine and glass enclosure and three shower heads. 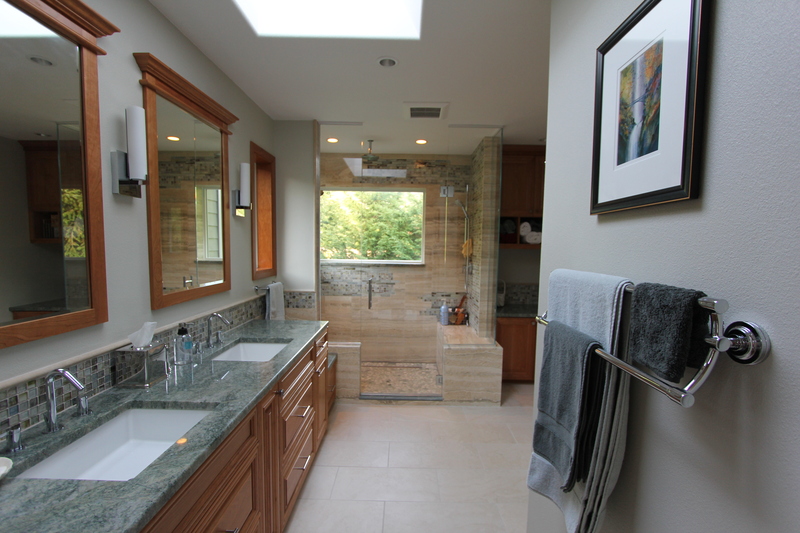 The old vanity with its blue-green tile counter top has been replaced with cherry cabinets and beautiful green granite top. Our drive back to North Bend consisted of two segments: Sedona to Ogden, UT (575 miles) and Ogden to home, an epic 778 miles in one day! 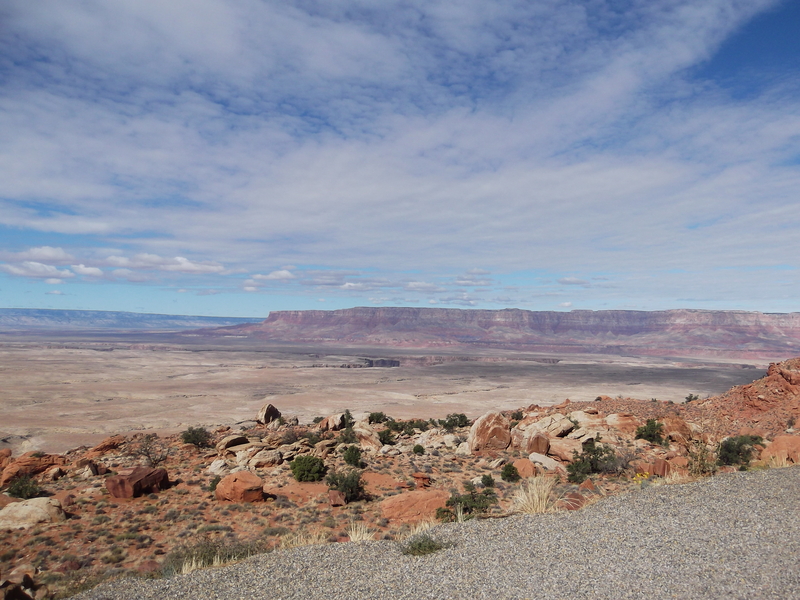 Between Page, Arizona and Kanab, Utah, route 89 passes by Vermillion Cliffs and Grand Staircase Escalante National Monuments. offering some stupendous vistas from the highway. The varying scenery and lovely weather helped make the miles go by fast (the 75 mph speed limit helped too). 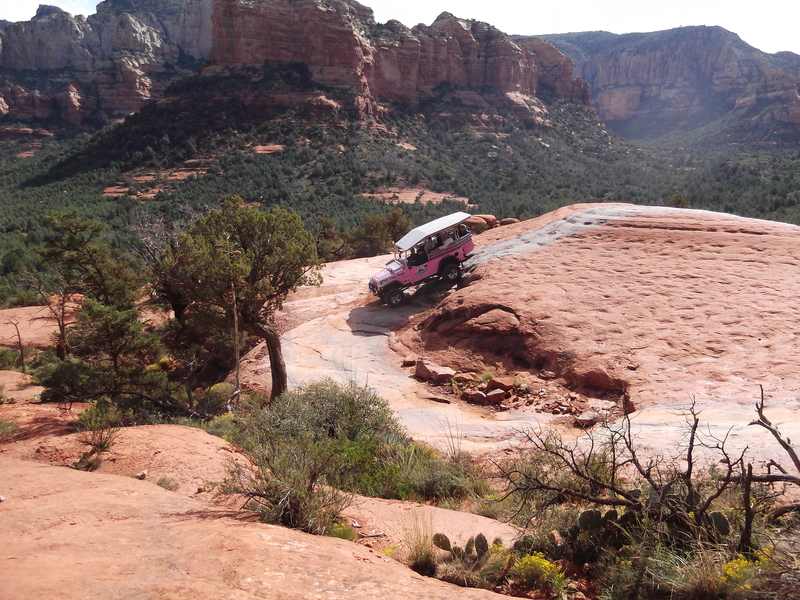 We were up early to take a morning tour of the famous red rocks by Pink Jeep Tours. The weather was perfect and we were treated to wonderful vistas in addition to some amazing off-road gymnastics by the jeep and driver. Lunch at the Cowboy Club featured Nopales cactus fries. After lunch, I joined Tessa, Katie and Will for a Segway tour. What a hoot. It was incredibly easy to learn to balance and navigate the Segway and what a joy zipping along the sidewalks in the crisp afternoon air. 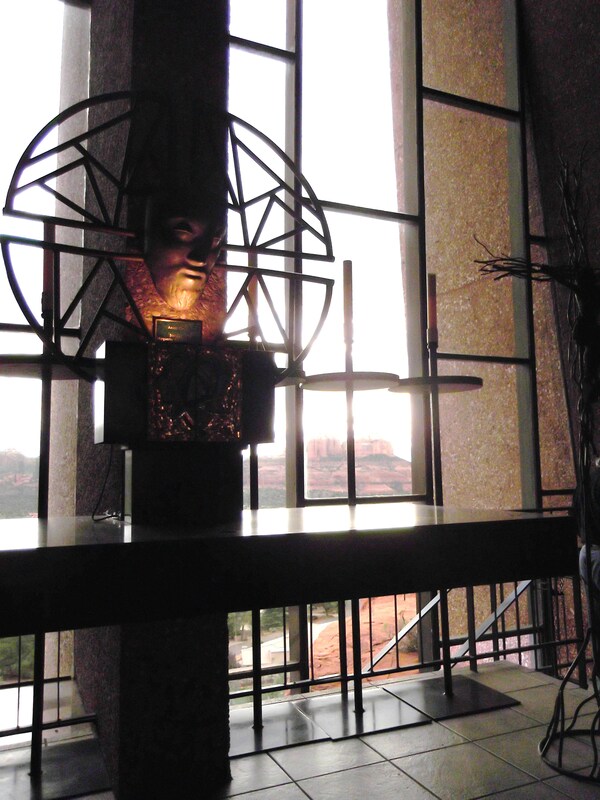 The halfway point of the trip was the famous Chapel of the Holy Cross, a small Catholic church built into the rocks with a stunning view of the red rocks to the west. We had no planned events today so we had an easy day driving just a few miles south on Hwy 179 to take in the views of the fabulous red rocks. Along the way we stopped in at a few galleries then visited the Tlaquepaque village with its dizzying array of art galleries. In the afternoon, we drove south to Tuzigoot National Monument. Ironically, perhaps the best vista of the day was the nearly full moon over the red rocks seen from our hotel room balcony. Today we made our way from the Grand Canyon to Sedona with a side trip to Meteor Crater, east of Flagstaff. We made a final stop at the Watchtower, at the east end of Desert View Drive, then said goodbye to the incomparable Grand Canyon. We began the day taking the park shuttle along the Hermit Road and then hiking a 1.5-mile segment right along the Canyon’s edge. Every vista seemed more stunning than the last one. A brief rain squall blew through while we waited for the shuttle at the turn-around point and we thought our afternoon helicopter trip would surely be cancelled. However, the weather around the helicopter tour route cleared and by 3:00 we were in the air. What a fabulous experience. Seeing the amazing canyons, cliffs, and mesas from above truly completes your appreciates of the beauty and grandeur of the topography. I could finally see the patterns of erosion and formed the Canyon over so many eons. 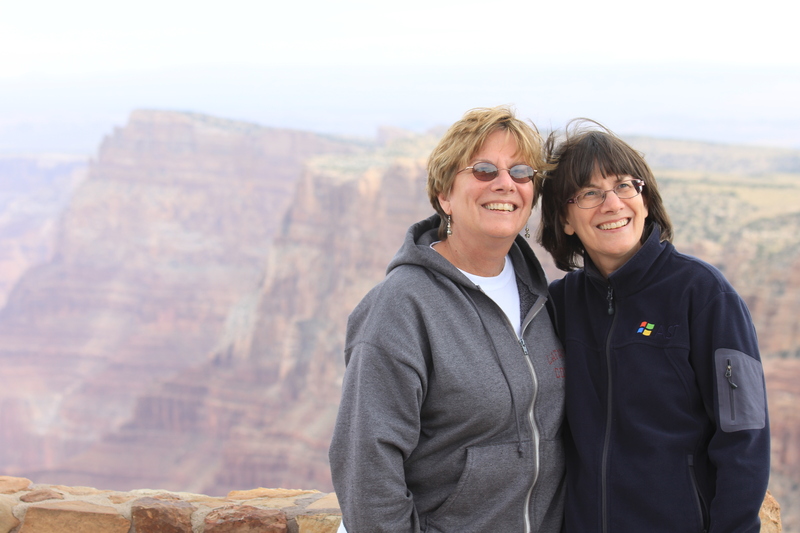 Today’s short drive of around 400 miles gets us to the Grand Canyon where we rendezvous with Trisha sister, Tessa, and her daughter and son-in-law, Katie and Will. We’re staying at the Grand Hotel in Tusayan, AZ (not nearly as fancy as the web site makes it look).